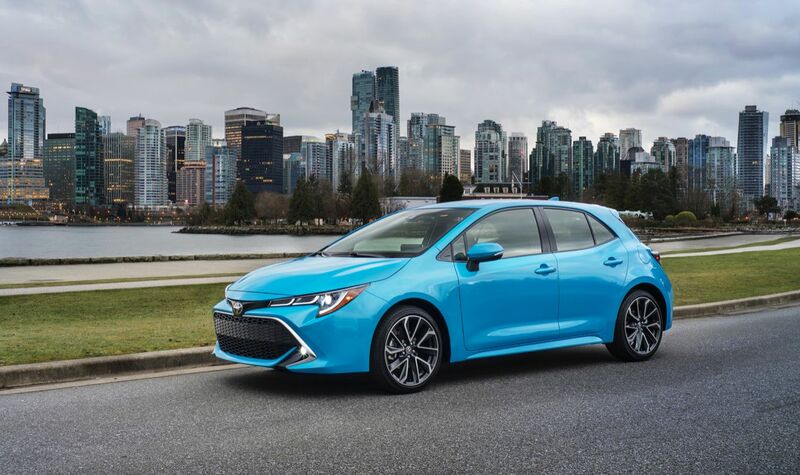 TORONTO, ONTARIO, March 28, 2018 – The Left Coast is the place to be this month, as the all-new 2019 Toyota Corolla Hatchback makes its Canadian debut at the Vancouver International Auto Show. The 2019 Corolla Hatchback benefits from revolutionary new performance and modern styling, all built off the foundation of the Toyota New Global Architecture design and engineering process. An all-new, two-litre inline 4-cylinder Dynamic Force engine boosts horsepower and overall performance compared to previous Corolla models, and the Corolla Hatchback will be offered with a choice of two transmissions, including an all-new direct shift CVT. With a lower centre of gravity, reduced weight, widened stance, and more, the Corolla Hatchback benefits from intuitive control and superior, more dynamic performance. Inside and out, sportier styling and high-quality fittings ensure that every drive engages all the senses. The Corolla Hatchback will be available exclusively in Sport trims, with high-grade LED headlamps and rear combination lamps, a rear spoiler, piano black trim accents on the instrument panel, push button start, a smart key, 8” display audio, automatic air conditioning, and more. Plus, Apple CarPlay and the Entune system deliver advanced yet easy to use information and entertainment services. As a Toyota, the Corolla Hatchback is extensively equipped with advanced safety technologies. These include TSS 2.0 – the second generation of the Toyota Safety Sense system, with even more active safety features. The all-new 2019 Toyota Avalon makes its first appearance on the west coast. The Avalon breaks with full-size sedan convention – exuding a daring personality with a more youthful and vibrant design. Avalon’s new look is matched by impressive engineering to deliver dynamic performance – including best-in-class handling. Inside Canadians will enjoy best-in-class roominess and a full complement of powerful, easy to use technologies such as Apple CarPlay, Smart Device Link, and more. The new Avalon is also best-in-class for safety and efficiency. The Prius Prime plug-in hybrid is going on sale across Canada this year – letting drivers from coast to coast discover what it means to be able to travel for more than 1,000 km on a single tank of gas and a full battery charge. Show attendees can book test-drives to discover why Prius Prime is one of the most advanced vehicles on the road today. The Toyota Mirai is a mid-size sedan with an important difference: under its stylish body lives a hydrogen fuel cell system that delivers incredible power and efficiency. The best part is, it’s a car designed for the real world – with driving range comparable to a conventional mid-size sedan; a long list of comfort, convenience and technology features; and more. Yet, its only tailpipe emission is pure water vapour. As Toyota prepares to bring this model to market, show attendees can book test-drives to discover why the Mirai represents a green future for Canadian drivers. The 2018 Vancouver International Auto Show takes place March 28 – April 1 at the Vancouver Convention Centre.